We had some friends over for Sunday lunch at the weekend, and it didn’t take me long to decide that I was going to cook roast beef and all the trimmings. Pudding was a bit harder to decide on, as I didn’t want anything too heavy. 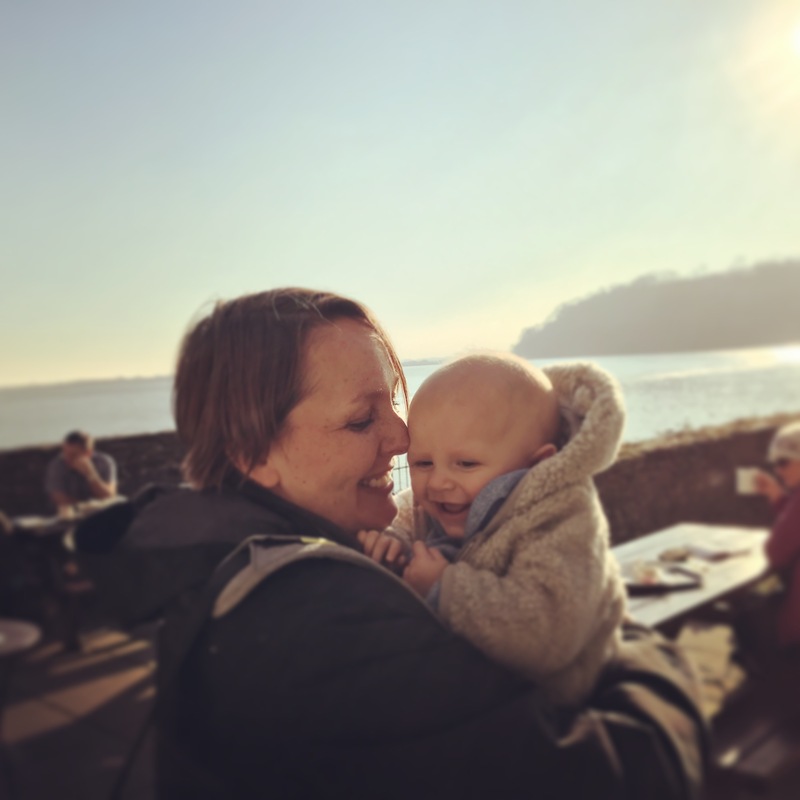 I asked people on my Facebook page but they all suggesting wintry puddings like sticky toffee pudding, rhubarb crumble, bread and butter pudding etc, which I didn’t think would be ideal after a big roast. My friend at Darkwood Books suggested pavlova, but fussy Andrew doesn’t like meringue. 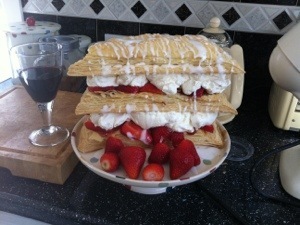 Then when I was watching an episode of Hairy Bikers Best of British where they cooked Mille Feuille or cream slice, and I decided that would be perfect with fresh cream and strawberries. And it was! Roll out the pastry into a rectangle – it should be approx the depth of a pound coin and cut into three equally sized smaller rectangles. Lay each piece onto a lightly greased baking tray according to the instructions on the packet (I had the oven on at 160 degrees and the pastry was cooked and lightly browned within about 20 minutes). Allow to cool. While cooling, whip the cream with half a teaspoon of vanilla bean paste and a spoonful of icing sugar until soft peaks (this is chantilly cream). Once completely cold, spread two of the rectangles with a thin layer of strawberry jam. Place one jammy rectangle onto a presentation dish and slice fresh strawberries on top. Spread with half of the chantilly cream, and top with the second jammy rectangle. 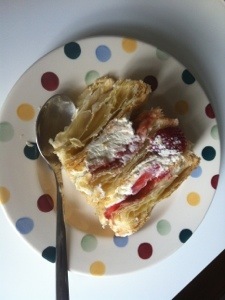 Again, slice strawberries on top, add the rest of the cream, and top with the final (unjammed) pastry rectangle. Mix some icing sugar with a little water and drizzle the icing on top of the pastry tower. Okay, it’s not very easy to cut, but it’s pretty spectacular when you bring it to the table! 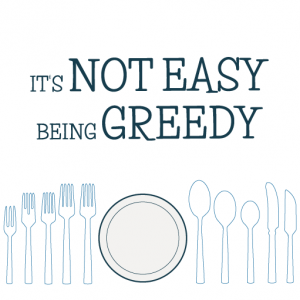 It would easily serve six greedy people. Thanks Maggie! 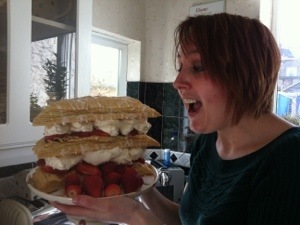 I’ll have to make some custard creams for Andrew to bring in – they are really amazing! Your pudding seemed really great and easy to prepare. It is a very good idea as the strawberry season is just started. Welldone Tracy.